At a time when Hollywood box office trends are tracked on a daily basis, with a summer declared a ‘hit’ or a ‘flop’ by the time its barely reached its half-way mark, it is refreshing to read a book that take a long term perspective on cinema box office. A really long term perspective. Oleg Berezin is a familiar face to anyone at the international cinema circuit. As the Managing Director of Neva Film, Berezin has been active in all aspects of the cinema and motion picture industry in Russia. In addition to providing everything from subtitling services to cinema installations, Neva Film is also the leading publisher of statistics and information on the cinema market in the Russian Federation. 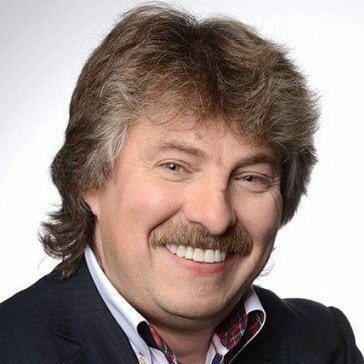 Berezin was also President as of National Russian Movie Theaters Owners Alliance Kinoalliance and organiser since 2001 of the Annual Kino Expo Conference Cinema Business held in Russia. Somehow, in between all this and his engagements with EDCF, SMPTE, ECA and more, he has managed to find the time to write a major piece of scholarly research on the cyclical nature of the cinema business. Berezin eschews the horse-race mentality of most of today’s cinema industry commentators, currently obsessing that Universal and Disney carved up 60% of this summer’s box office between them, and instead looks at trends that span decades. 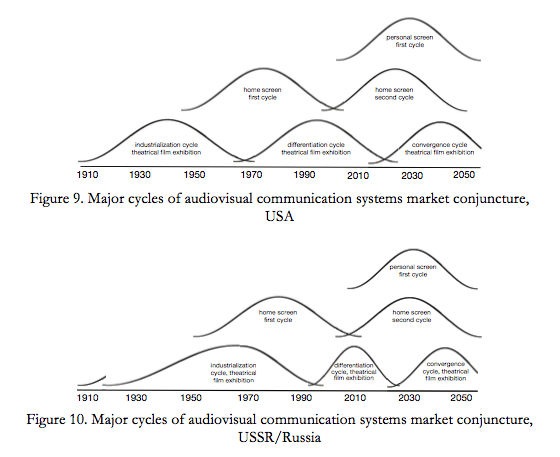 In doing so he is embracing the hypothesis of the existence of cycles in motion picture consumption, which is in turn based on the theory of major cycles by Russian economist Nikolay Kondratyev. 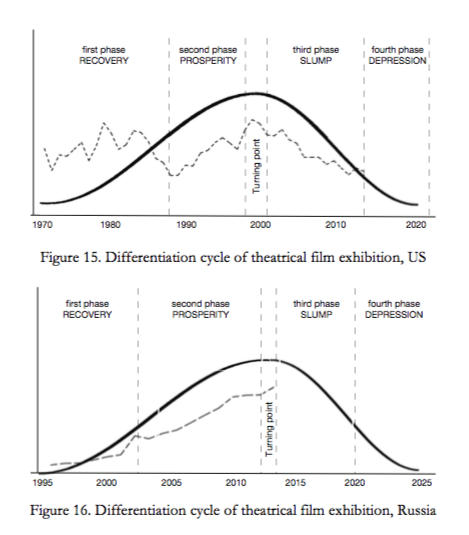 The idea of applying Kondratieff wave cycles to the motion picture industry is a bold one, not least at it is a medium that have simultaneously exhibit enormous change (sound, colour, digital, home and mobile consumption) as well as remaining stable (there are active cinemas that have been in continuous use for over a century). Second, there are systems for family or group film viewing: home movie theaters and TV sets. To some extent, small-scale cinema halls (private, home- based, and commercial) may also be treated as such. Third, there are systems for personal viewing. Gadgets belonging to this category include TV sets and PC monitors…and personal gadgets: portable-screen DVD players, smartphones, tablets, video-glasses, laptops, and others that are similar in their consumer properties. Films have today in many ways returned to their pre-cinema roots, when it could only be consumed one-on-one in the Edison peepshow Kinetoscopes, as noted by Oscar-winning sound designer and film theorist Walter Murch. Berezin is thus not trying to brush away the innovations and changes that have happened to film beyond the big screen, but embrace them as a manifestation of the “cross fertilisation” of the different screen system, and also sees it as a way of forecasting the future of the medium. Berezin’s second bold move is to frame the analysis within the context of two markets: the United States and USSR/Russia. While not a given choice at first glance, there is much that unites these two markets over the long term, not least in terms of being major global economies. Despite having had a command economy during its communist years, Soviet Russia always maintained a vibrant (if censored and controlled) film and cinema industry, which has survived and re-flourished after the fall of communism. Anyone looking for the best cinemas being built today would be hard pressed to chose between a VIP luxury screen in Saint-Petersburg or an Alamo Drafthouse opening in Los Angeles. 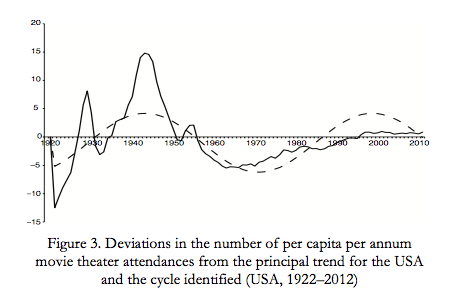 Berezin also draws on previous scholarly work on trends in cinema attendance from the likes of Pautz, Kokonis, Vogel, Zhabsky and others. Validating a key premise of the Kondratieff cycles is the influence technical innovation has business cycles, with the mass adoption of television in the United States in the mid-20th century directly linked to the decline in cinema attendance and ensuing attempt at introducing innovation in the exhibition business – colour, widescreen, stereoscopic 3D, etc. While cinema attendance has fallen in adult numbers (i.e. tickets sold) since then, a look at per capita per annum deviations in the US does confirm a cyclical trend (see above). Interestingly, despite the headlong growth of the film screening market in the US during the last 40 years, its annual box office has stabilized at the level of USD 4–5 billion in 1984 prices, adjusted for the CPI63. On the one hand, this suggests there is a certain limit to the financial market capacity for film exhibition. On the other, it serves as a visible example of the physical laws of wave theory in action: the curve of box office dynamics results from a superposition of two waves—the cycle of motion picture attendance and the cycle of ticket price. Berezin then does an admirable job of plotting the cinema cycles against the two consumer electronic trends that have most influenced film consumption, first for the home and secondly for personal devices – what we today talk about as the ‘second screen’, meaning the ‘other’ screen to the television and now also the cinema, rather than sequentially, in which case it ought to be ‘third screen.’ (see diagram below). In doing so he refutes the notion that new platforms for consuming films spell the end for the medium that preceded it. In this regard the Kodratieff cycles for film/cinema would seem to refute the ‘Creative Destruction‘ hypothesis of economist Joseph Schumpeter (one of Kodratyev’s strongest supporters), whereby steam engines replace canal barges for transport, automobiles kill off trams and email spells the end of faxes. While not touching on the artistic aspects (which would have made this study impossibly long and complex), it also chimes with the theory put forward eloquently by French-Canadian director Robert Lepage that new forms of visual and audio-visual art do not replace what comes before it but liberates it, with photography not destroying painting but freeing it to explore abstract, cubism, pointillism and more, rather than aiming for pure visual reproduction, same as theatre has become avant grade and not killed off by cinema. Berezin displays an almost encyclopaedic knowledge and understanding of cinema history, as well as reaching back to the stage theatrical entertainment business that preceded it, both in Tsarist Russia and Elizabethan England, as well as the later early US theatre (as in play performance venues) of the late 19th century. The history of the invention of cinema is detailed, but while of interest to cinema archeologists as myself, is perhaps too much detail without going into disputes of origin (no mention of Louise Le Prince, for example, and on page 49 German cinema pioneers Emil and Max Skladanowsky are reduced to “M.S kladanowsky” [sic]), meaning that in some ways it is not detailed enough. But this is a small quibble and one can only hope that Berezin finds the time to devote a full book in the future just on this topic. 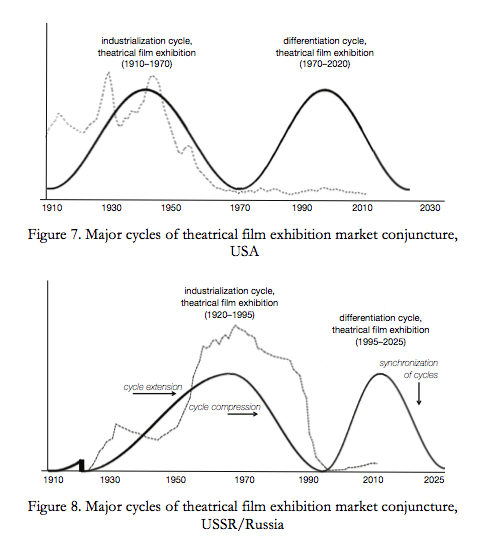 Chapter Four on ‘the Industrialisation Cycle of Theatrical Film Exhibition (USA: 1910–1970; USSR/RUSSIA: 1910/1921–1995)’ is where Berezin really hits his stride. Given his country of origin it should perhaps not be surprising, but Berzin provides very illuminating examples and anecdotes about the growth of the film and cinema industry in early Soviet Russia, which should be of particular interest to readers of the English edition of the book, being perhaps already familiar with the similar early period for the Hollywood industry. Predicting the development of movie theaters and exhibition for the next 15– 25 years, when the next cycle in the development of the industry – convergence – enters an explosive phase, is a challenging task best suited to futurologists. But with the disclaimer out of the way he then sets about pretty much doing just that; predicting the future of the cinema industry, though in scholarly rather than sensationalist terms. (Sorry, no indication about whether we’ve reached ‘Peak Superhero‘ or if the next cycle of Star Wars and Avatar films will be mega-hits). Anyone who had been paying attention in the previous chapters would have seen a worrying downward slope of the curve in terms of where cinemas find themselves today. Berezin’s interest lies not so much in predicting the future as in seeing how cycles are likely to play out, given future changes of technology. This entails defining at least two components, ” the starting point of the cycle and the principal directions of technological progress.” As such the fourth cycle of film is estimated to begin in the period 2020-2025 and will be characterised by a ‘convergence’ of all three film consumption platforms: public, home and personal. The crystal ball takes in everything from buzzwords like “transmedia storytelling” to specific technical concept such as the the Disney KeyChest digital cloud, but the point about content becoming increasingly independent of platforms is a valid and important one. This then entails an understanding of the home and personal screen technology systems. Again Berezin knows his history, but these sections seem less necessary towards his overall point than the cinema history chapter. Berezin’s conclusions might seem heretical to cinema purists. “First, the audience consuming all three systems of audiovisual communication – movie theaters, home screens, and personal screens – is, for all practical purposes, one and the same.” Not all screens may be created equal (in size, that is), but as far as most consumers go, they are almost interchangeable when it comes to watching films. Here the principal bone of contention with Berezin’s cycle would be that his two home screen cycles neatly explain broadcast television, but offer less account of packaged home media (VHS, DVD and Blu-ray), whose peak in terms of commercial impact was in-between the two home screen cycle’s peak points, particularly for the United States. This may not be a book written for the widest possible masses in the style of “Freakonomics”, but a dense, deep and scholarly text. (Berezin himself joked that it makes good reading for insomniacs.) Yet it is all the better for it, as anyone who can navigate through the early chapters on the long-term cycle economic theory that underpins it will find a rewarding, illuminating and stimulating journey through a century of the cinema medium, with a credible argument for its long term viability in its fourth ‘cycle’. Here it is also worth highlighting the excellent English translation by Mikhail Prokofiev, as well as the text edit of the English translation by Nick Holdsworth and Elisa Koshkina, which makes the book read as if it had been written in English in the first place. This book is worth anyones time who cares about where cinema has come from and where it is headed and is available on Amazon now.